Finding a foundation that ticks all the boxes is no easy task. I'm the first to admit that I'm incredibly picky; my perfect base needs to feels weightless, look flawless, yet appear natural and luminous. Tall order, right? Many of my fleeting, foundation flings have run their course, but my demanding self always return to one. Chanel Vitalumiere Aqua Foundation. 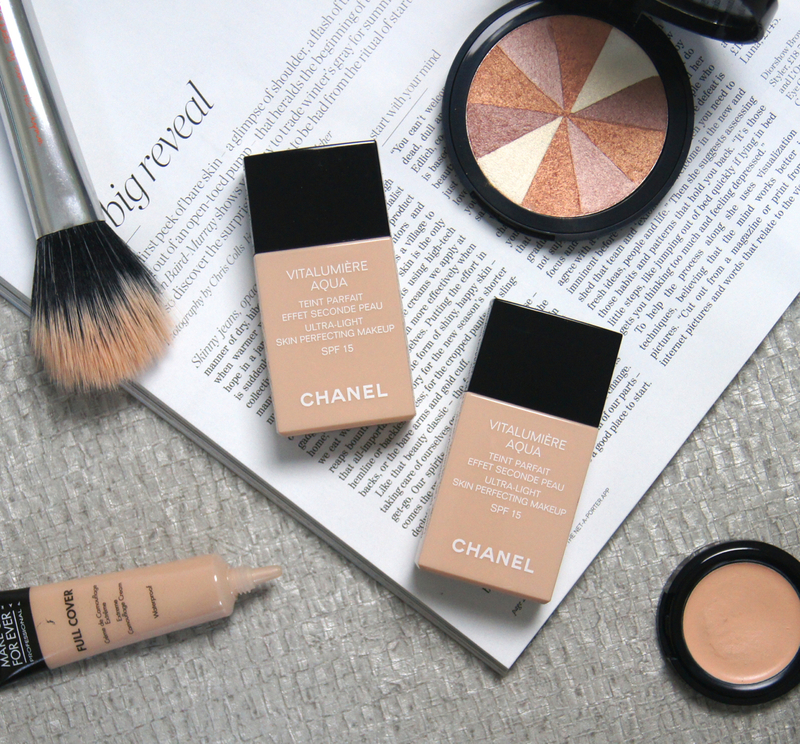 Chanel foundations are hailed as the creme de la creme in the beauty industry and I wouldn't expect any less from such a classic, premium brand. The original Vitalumiere formula is a dry-skin dream, offering a sheer coverage with an illuminated, glossy-looking finish. Although the name would suggest otherwise, Chanel's Aqua version actually provides more coverage and a satin finish, making it longer-wearing and better suited to normal/oily/combination skin-types. Liquid foundations usually fall into one of two categories, in my eyes. They're either thick and heavy-looking, leaving you feeling like you just smothered on a coating of cement. Or, they're sheer and fresh, yet enhance the complexion so subtly that you wonder why you bothered at all, whilst reaching for a high-coverage concealer. Only a select few manage to find a happy medium and escape my harsh judgement, with Chanel Vitalumiere Aqua taking the top spot. The ultra-fine, fluid texture of this face base is just so unbelievably feather-light. Whipped into a creamy, mousse-like consistency, the silicone-in-water formula feels so refreshing and light, that it feels as though your face is completely bare. There's no suffocating, mask-like effect whatsoever. Just don't forget to vigorously shake the bottle before application, otherwise the formula will separate and you'll just squeeze out a watery liquid onto the back of your hand. Providing a sheer to medium coverage, the perfecting makeup effortlessly melts onto the skin, taking minimal blending for an even finish. No matter how much you apply or build up the foundation in layers, it never starts to cake. Having a satin finish, the makeup imparts a glow that you can't quite put your finger on, as it isn't at all shimmery, nor too dewy. Blurring any imperfections, rather than completely camouflaging them, Vitalumiere Aqua creates a soft-focus veil, that has an almost ethereal quality to it. Seriously, I could imagine angels wearing this stuff. Not that I believe in them, but y'know what I mean. Whenever I reach for it, I just can't believe how amazing it makes my skin look; flawless, radiant and healthy. An SPF of 15 will give some protection from the sun, but I do find it can cause a white-cast in flash photographs. As a standard, Chanel foundations have that instantly recognizable, apricot scent to them, which may cause irritation for anyone with skin sensitive to fragrance. Personally, I've had no issues with any of their bases, but I'd always recommend trying a sample before making a purchase, just to be on the safe side. 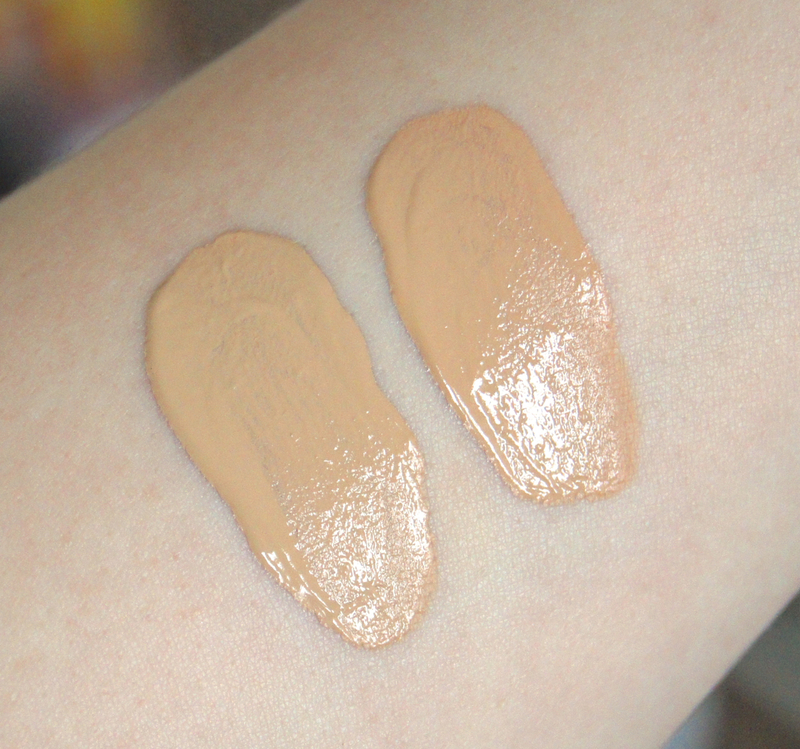 There's just a couple of downsides to this foundation, taking it from a full 10/10 to a still-respectable and impressive 9/10. It isn't the longest-lasting formula when the weather heats up, even on my drier skin. Usually, in my everyday routine a primer isn't a necessity. But, when wearing Chanel Vitalumiere Aqua, I have to prep with my trusty tube of Clarins Beauty Flash Balm (reviewed in this post) to make it last all day. In an ideal world, I'd like it to remain looking perfect without a helping hand, but the unbeatable finish is worth the extra step, for me. Another issue that's frustrating about the whole line of Chanel foundations, is that their shade range is so minimal, ignoring the needs of those at each extreme end of the skin-tone spectrum. To be fair, Chanel isn't the only culprit, but it's something that needs to change. As I love the formula so much, I've bought two shades of this base, B20 and B30, to mix and create the perfect colour for my skin. The swatches above are on my inner arm when I'm at my palest, but I assure you they do match the rest of my skin as summer progresses! Instead of being housed in the glass packaging typical of Chanel, Vitalumiere Aqua comes in a cheaper-looking, plastic bottle. It may not exude luxury or look quite as attractive, but the compact bottle still contains the standard 30ml and is much easier to carry around. At £33, this base hasn't evaded Chanel's guilt-inducing price-point. But, as this is such a unique foundation that performs so well, it's difficult not to agree that it's worthy of the extra expense. 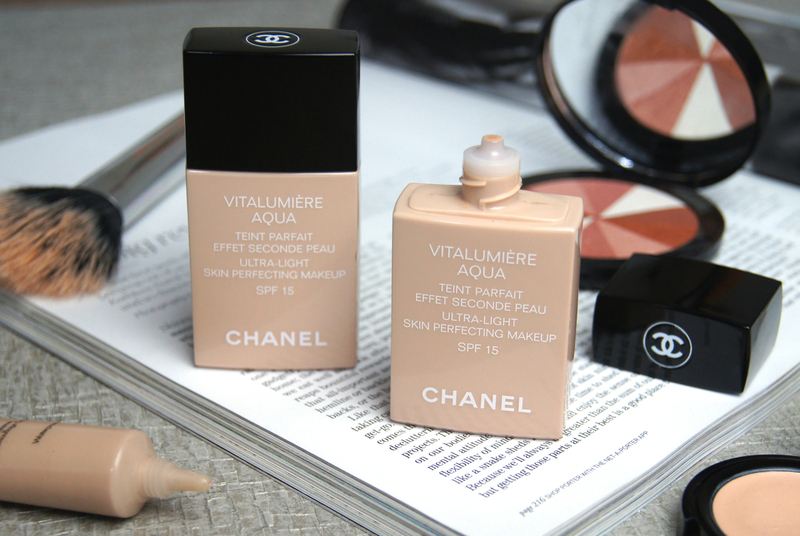 Have you tried Chanel Vitalumiere Aqua Foundation? Loved this review, you write so descriptively and provide a really in-depth insight! I currently have Chanel's Perfection Lumiere but would prefer something a little lighter, and this seems to tick the boxes as far as that's concerned! Also I couldn't put my finger on what their foundation smelt like - I knew it smelt good but I didn't realise it was apricot so thanks for sharing that haha! This is the one foundation I am desperate to try. After seeing Vivianna Does Makeup talk about it all the time and now you, I need it ahhh!!! It sounds incredible and exactly what I look for in a foundation! you shared very good post on foundation and my girl friend like to wear make up when ever we meet and i think this kind of foundation can be more simple and her skin friendly. 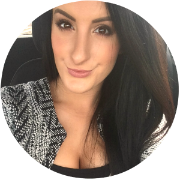 I will recommend her your blog so that she can have some good information. Just purchased this foundation, Love your site do check mine.